Bengaluru, April 17: With an aim to spread awareness about the ill-effects of tobacco consumption among the people of the state, the Karnataka State Anti-Tobacco Cell of Department of Health and Family Welfare has requested the election commission to ban the sale of tobacco within 100 yards of each polling booth during the Lok Sabha Elections 2019. According to the report, published in The New Indian Express, the ban would be implemented in all 30 districts in the state, including Bengaluru Urban. Also, the Karnataka State Anti-Tobacco Cell made it very clear that offenders or shop owners who don’t comply will be fined. It also informed that the team would conduct surprise checks at polling booths to ensure strict enforcement of the initiative. Liquor Sales Up During Lok Sabha Elections 2019 In Tamil Nadu, Alcohol Worth Rs 500 Crore Sold In 3 Days. Informing more about the initiative, state nodal officer of anti-tobacco cell Dr Selvaraj said, as the daily quotes, "We want people to understand the drawbacks of smoking tobacco. 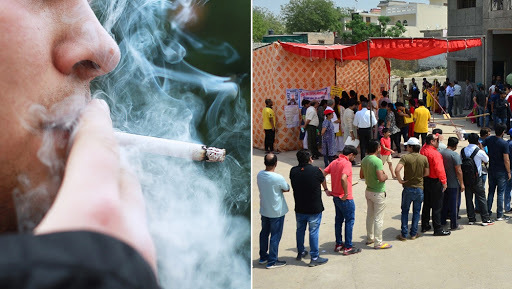 Since polling booths are set up in public spaces, we want to restrict passive smoking situations. Offenders will be levied a fine of Rs 200, whereas shop owners will be charged Rs 200 per offender caught near the shop." Adding more, Dr Selvaraj added that the state health department is working with the Election Commission and trying to curb any situation where people can bribe voters by offering cigarettes to them. Also, Chief election commissioner Sanjeev Kumar affirmed that the rules will be strictly followed, making all polling booths will be tobacco-free during the election.